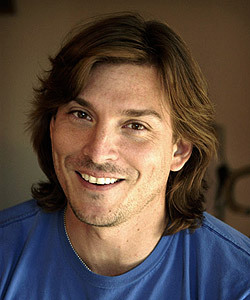 Alex Bogusky is world famous designer, marketer, author, and consumer advocate; founder of the advertising company Crispin Porter + Bogusky. He has won all possible awards from all the biggest advertising festivals in the last 15 years and have a cult status inside the advertising society. Named often the Elvis of Advertising. But in 2010 he quitted the world of advertising and start new visionary project called FearLess Revolution (together with Rob Schuham and John Bielenberg). Recently they launched the new consumer oriented brand – COMMON. The fact is we all consume to live. The food we put in our bodies, the clothes we put on our backs, the devices we use to do our jobs, and the energy that goes into everything we touch. Together we consume A LOT. Yet our expectations are too low. We think we have to accept the bad that comes with the good. The pollution that comes with the energy. The unsafe working conditions that come with low prices. The toxic materials that come with convenient packaging. We can do better. Wanting stuff isn’t going to change. So maybe it’s time to want more – more from ourselves and more from the people who make our stuff. Umair Haque manages to put forth a radical idea, and sketch a framework of how we might go at building a business in its image. He has moved beyond the idea and draws a blueprint for constructive capitalism that makes a lot of sense. It means that we need to rethink why we are in business, how we do business, and what it is that our business does. Apart from the obvious differences in style these ideas are very similar. And they’re not exactly coming out of the blue. A few years back, we had sustainability – everything had to be green. Then every corporation was saying that “being green makes perfect business sense, because we saving soooo much on our energy bill”. Next thing, CSR came around. So we’ve been on a slowly cresting wave towards a greater consciousness that it’s time for business to change its ways. Because that’s where these ideas are so radical: they propose a way of thinking that is fundamentally different from run-of-the-mill capitalism which will lead to a more social way of doing business. They are attacking the problem at the root, in stead of chasing symptoms like we’ve been mostly doing so far. To me, all of this falls perfectly into place with the upcoming movements practical idealism, social entrepreneurship design thinking, business model innovation, service-dominant logic, brand driven innovation and more of such frameworks, which in one way or other, describe a way of doing business that’s fundamentally good for the customer, and built on top of a core set of beliefs that guide the organisation, rather than just profit maximization. FearLess Revolution explores a new relationship between people and brands. We’re seeing a dramatic shift in the way business is done towards more transparency, more collaboration, more democracy, and ultimately more value. The duties of citizen and consumer are colliding. We have come to believe that we can build… An open-source living network for a new brand of capitalism. A living network that gives creative people: A chance to design and prototype the new capitalism. Our goal is no less than to spark a global movement. We aim to build a community where designers, strategists, vertical experts, celebs, capital, media, and anyone else with the credible talent to help us to launch more new capitalism projects. Rapid, ground-up business creation. A new breed of business – built on values the community holds dear: transparency, sustainability, accountability. As the network of businesses grow – branded alike – they will be able to tackle even larger and more complex problems through shared data and best practices. companies famous. Focusing beyond the consumer/corporate agreement to create exposure for the new brand of capitalism projects. We will be reporting on a future where fun and profitability come from making people, society and even future generations better off. Benefiting people, communities, society, the environment and future generations is the new advantage in business. Our new capitalist brand is about transitioning from competitive advantage to collaborative advantage. A brand that isn’t an institution but is instead a living network. A brand that provides collaborative advantage rather than competitive advantage. A brand that can represent a new capitalist philosophy. A brand that is open to all that agree to the community rules. Design a HUGE brand for small progressive capitalists. A brand that is community designed. Community owned. Community directed. Common purpose, common goals, common means, and common values. A common brand to encompass products, businesses, and ideas of the common community. COMMON – A global brand and a huge library of brand elements. Brand awareness far beyond that of any startup. The business development platform of the community. A pool of best practices and wisdom within our businesses. Experts in multiple fields of business. A community of shared and supportive business values. The buying power of the community. 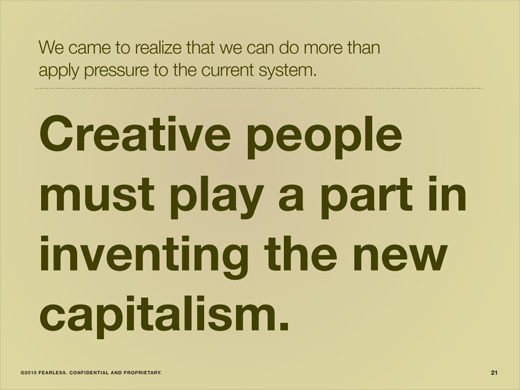 ← Could Creativity Reinvent the Capitalism? Umair Haque, Alex Bogusky and Michael Porter say YES!